Fuzzy front-end design and prototype for a mobile phone application which empowers women to be safer by providing them with information. The final prototype is an interactive PowerPoint presentation available here. A product poster describing the compelling qualities behind our design and implementation. 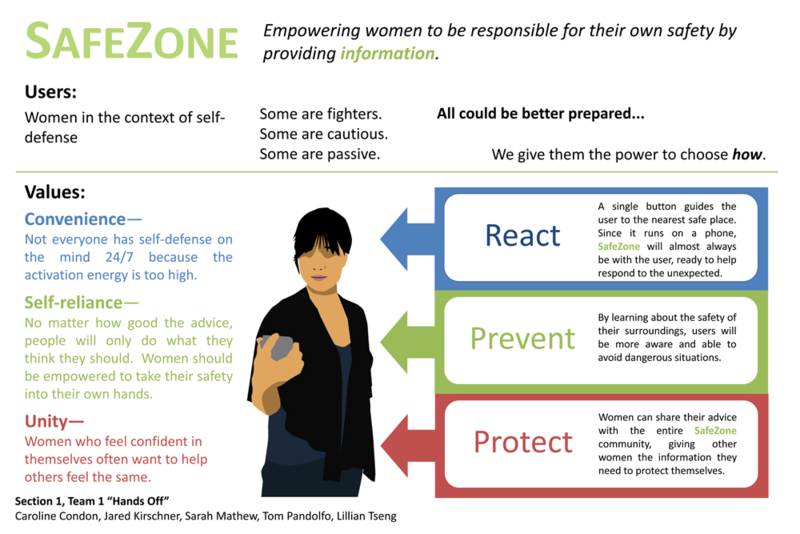 To design something (product, service, or otherwise) which will improve the lives of a specific user group: women concerned with self-defense. Designing something which is compelling and useful for a user group requires an in-depth understanding of user needs, values, and identity. To gain this understanding, we observed and interacted with women concerned with self-defense in various settings. We would then generate ideas based on what we learned and return to the users with rough prototypes of some ideas to get frequent feedback. It is important to iterate at the early-stages of product development, where changes are much cheaper in both time and money. The result of our user research led us away from what is traditionally associated with self-defense: tasers, pepper-spray, and alarms. We chose to design a product which would help women avoid a confrontation in the first-place. The product allows women to plan safe routes and receive advice about an area for other women. If a woman finds themselves in a dangerous situation, she can use the product to follow the quickest route to a safe location. By implementing the product as a phone application, the user will likely have access to the product even in unexpected circumstances.